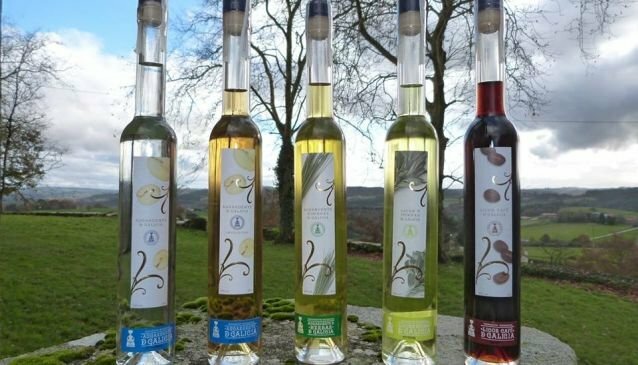 The Regulatory Committee for Galician Aguardiente and Traditional Liqueurs control and endorse products and guarantees that the orujo comes from the vinification of grapes produced in Galicia. The systems and techniques used in their elaboration are based on traditional distillation practices using skills and steam distillation. This ensures products of maximum quality which meet all health standards, the same level of control that exists for wines. It is a unique regulatory body which controls distilled sub-products related to viticulture that exists in Spain. Aguardiente de orujo is closely linked to the wine making process and was spread by the Way of St. James pilgrimage route (El Camino de Santiago). This amounts to centuries of tradition during which aguardiente de orujo was attributed medicinal,curative and even magical properties. An example lies in the 'quemada', a ritual where the celtic elements of fire,earth and water mix. Galicia is the only Spanish region which has the right to the Geographical Indication of Aguardiente de Orujo, in the same category as the French marc, Italian grappas and Greek tsipouros. Aguardiente de Orujo is elaborated from fermented grapes harvested In vineyards located in Galicia. It is clear with an intense aroma of herbs,white fruit,citric,rose and jasmine and is best served at a temperature of 8-10 degrees. There are 131 registered businesses producing orujo. Herbal Aguardiente is a spirit obtained from Aguardiente de orujo via maceration and/or distillation of the alcohol with the herbs that characterise it such as mint,camomile,lemon verbena,rosemary,oregano,thyme,corainder,orange blossom,liquorice,nutmeg,cinnamon and fennel. It's colour varies depending on what herbs are used and it is sweet with a persistant taste. It's best served at a temperature of 8-10 degrees (between 37.5-50% alcohol). Herbal liqueur is a spirit is of ethyl alcohol via maceration and/or distillation of the alcohol with the herbs that characterise it.such as mint,camomile,lemon verbena, rosemary, oregano, thyme,corainder,orange blossom,liquorice,nutmeg,cinnamon and fennel. It's colour varies depending on what herbs are used and it is sweet with a very persistant taste. It's best served at a temperature of 15-18 degrees(between 20-40% alcohol) . Coffee liqueur is a spirit is of ethyl alcohol via maceration and/or distillation of the alcohol with natural toasted coffee. It's colour is brown and it is sweet with a very persistent taste. It's best served at a temperature of 15-18 degrees (between 20-40% alcohol). The main consumers of the products are from Galicia and the north of Spain and in Madrid and Barcelona. The export market is still very small although you can find the products in Belguim,France,Mexico, Germany and Holland and emerging markets in Asia and South America.